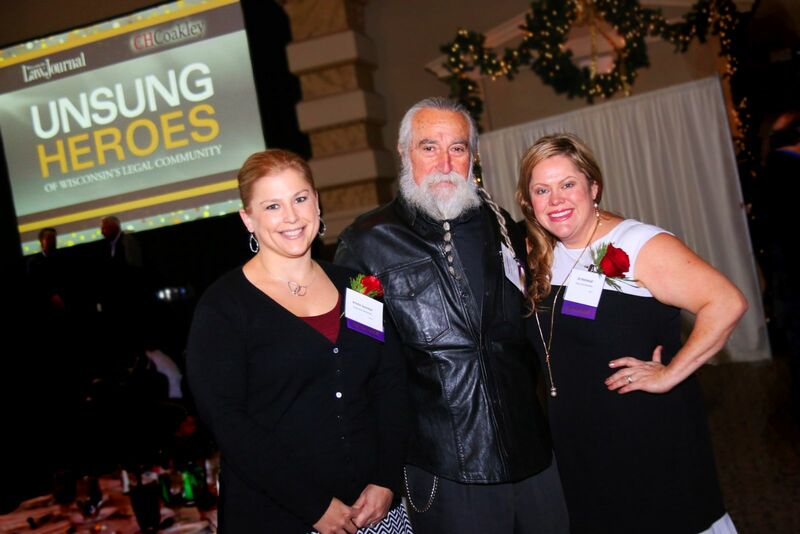 Honored for Outstanding Work at Unsung Heroes Award Ceremony | Hupy and Abraham, S.C.
On Thursday, December 1, 2016, the Wisconsin Law Journal held its annual “Unsung Heroes” event, which honored three firm employees: Jill Wellskopf, Kristin Sommer and Tony “Pan” Sanfelipo. Over 300 members of the Wisconsin legal community attended this event. “Unsung Heroes” recognizes that support staff has a large impact on the success of a law firm, and highlights the best employees from firms throughout Wisconsin. Out of the 26 honorees for 2016, the three Hupy and Abraham, S.C. employees featured were able to celebrate their accomplishments that they achieved during their careers. Each of these staff members has made an impression in their departments: Marketing Director Jill Wellskopf, Legal Assistant Manager & Receptionist Supervisor Kristin Sommer and Senior Motorcycle Investigator Tony Sanfelipo. The excellence that is a constant presence throughout the company is something that not many companies or law firms can maintain. Hupy and Abraham, S.C. congratulates and thanks Jill, Kristin and Tony for their hard work and dedication that resulted in this award.